Our flexible PVC Bollards are ideal for lane delineation and traffic control on roadways and in car parks. If accidentally run over the flexible plastic bollard will return to its upright position. Reboundability: made from long-life PU material with exceptional vertical rebound resilience, tensile strength and impact resistance. 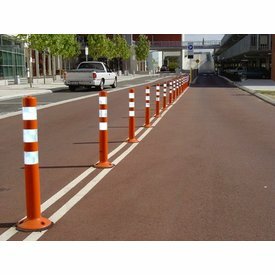 Visibility: bright fluorescent orange colour with high intensity reflective banding ensures high visibility both day and night. Durability: the flexible technology incorporates "vertical memory" for the fast recovery of the bollard no matter how many times it is hit. 750mm high Simply bolt down to existing road surface. * Actual product may vary slightly in appearance from image shown.